Jeff, JT, James and Tony, who are college friends down from Boston, chartered the Top Shot Sportfishing charter boat team for a private deep sea charter boat sport fishing trip in Fort Lauderdale, FL The seas were 2 to 3 foot with easterly winds with a light chop. We started the morning catching baits called Bonita at an anchored ship. The ship was anchored in 150 feet of water, and these baits will school around the front and bottom of the hull, which gives them structure. We were using smaller jigs and catching them close to the side of the ship. All the anglers took turns catching the fish, and we ended up catching 10 of them. Next, we decided to kite fish. We used two kites, a left and a right kite, with 4 live baits, using a release kite clip so that when a fish strikes the line will fall from the kite. We also put a bait on the bottom with a 1 pound lead, and we were using a king head targeting larger fish. Then a Sailfish came up to feed on the long bait, and I yelled down to the guys – Sailfish! The angler, Jeff, set the hook, started reeling the tight line in. The Sailfish jumped multiple times and made some big runs going deep and back to the surface. 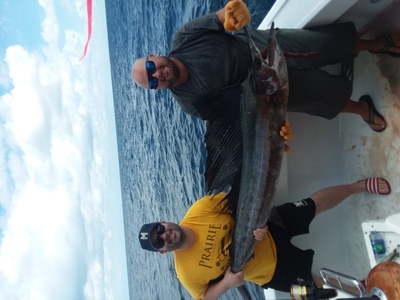 After a good battle, the Sailfish came up alongside the boat, we got a measure, snapped a photo, removed the hook then released the Sailfish back into the ocean to be caught another day. The Sailfish swam away good and was in a healthy condition.